2019 Captain Marvel Movie Review!! In the ending credits of Avengers: Infinity War, Nick Fury realized the Earth was in danger and The Avengers were not available to face this threat. Nick sent out a signal to Captain Marvel, a new hero fans have yet to see on-screen. 2019 Captain Marvel grossed over $550 million dollar so far, overshadowing any doubt that Captain Marvel will perform well among the latest Marvel releases. Was Captain Marvel everything you expected? Carol Danvers is apart of the StarForce, a team which is similar to the Nova Corps in the MCU. In fact, The Nova Empire and the Kree Empire have a peace treaty with one another, which created an uproar among many. We get to see this how life was during this treaty and the conflict it created with the help of the cameo appearances from Ronan the Accuser and Korath the Pursuer. Their appearance in this film help express their importance in the Guardians of the Galaxy film. Why do you think Captain Marvel is used in the cinematic universe instead of Nova, when Nova was in the original story when Earth heroes fought Thanos for the Gauntlet? What of Adam Warlock? Adam was mentioned at the end credits of Guardians of the Galaxy Vol2. He had a major playing part in the fight against Thanos and the Infinity Gauntlet. Will he make an appearance in the upcoming Avengers: Endgame film? The Skrulls made an appearance in this film but their début was not as expected. Know as a villainous, devious warrior race in the comics, this version of the Skrulls turned out to be the victims of the Kree Empire. Mar-Vell was responsible for creating an engine which has lightspeed capabilities, an engine to help the remaining Skrulls evade the war and find a new home far away in the cosmos. Mar-Vell was killed for her secret project and the power core it has, which turned out to be the Tesseract. The likeness of Mar-Vell was then taken to become the Supreme Intelligence of the Kree, and this is where Carol uncovered the Kree’s true intentions which were completely hostile. In the comics, Mar-Vell was a male warrior and was known as Captain Marvel for quite sometime in comic publications before changing that role to a female. Do you think it the change for Mar-Vell was just or was it nothing more than a unnecessary change producers made to the comic story? The Stones that power the Gauntlet are from cosmic origins and they ultimately control the fundamentals of the universe. In the comic story, Thor was the strongest Avenger to battle Thanos. In the cinematic universe, Thor’s powers have doubled when fighting against his sister Hela, then increasing to greater heights after receiving Stormbreaker. Stormbreaker was specially designed by Eitri to combat the controlling power of the Gauntlet. This means that the full might of these weapons are determined by the will of the wielder. Are producers trying to convey that Captain Marvel could be perhaps stronger than Thor in the upcoming Endgame or will she just become another team player? Avengers Endgame will release April 26, 2019 answering all questions on were this story of the Infinity Gauntlet could be headed! What were your thoughts on Captain Marvel? Do you think she measures up to the universal threat laid before the Avengers? Be sure to check out the new Captain Marvel statue at Side Show Collectibles!! Batman V Superman: Dawn of Justice was a excellent movie among many superhero films! This is the first time that these two characters have met live on film. Critics slammed this movie so much it made comic fans even more intrigued to see it. The weekend total sales for this movie was 424.1 million dollars which shows that movie critics cannot figure out the outcome for such a film. This movie was a mixture of the Frank Miller story of Batman v Superman, Superman: Doomsday, and Justice League War. The total sales for the film is $873.6 million million dollars. The best part of the film is the showdown between the two heroes. What’s interesting about this showdown is that Batman viewed Superman as a threat because of the destruction in Metropolis. Before Superman, humans thought they were alone in the universe. Now an alien from space is now the savior of the planet?? Batman had a vision of a possible future Earth, where Superman decided to use his power for control. Superman viewed Batman as a criminal, and working outside the law goes against what Superman stands for. In the end, Superman can easily destroy Batman with brute force. Batman, on the other hand could outwit Superman and defeat him. So the conclusion is that both characters realized they are better together than against each other. That’s what heroes do! Jesse Eisenberg as Lex Luthor!!!! This is the most common dislike among most comic fans. If anything, Jesse could play a perfect Riddler. That’s only if The Riddler is featured in any future Batman movies. This is the ONLY dislike Comic Multiverse has rated for this film. Marvel comics has the “one up” on DC Comics with their costume design. Black Panther and Spiderman of Captain America: Civil War, have eye covers for their masks. Batman did have that feature but only for his armored suit. In this film, we couldn’t see Batman’s vision behind the armored helmet. Its possibly that the appearance of his vision would be similar to Iron Man’s helmet in the MCU. But if Batman’s regular costume was equipped like Black Panther’s, we could see Batman switch through his different visions as shown in most animated films or video games such as Arkham Knight. This deleted scene has comic fans speculating. Lex is seen in communion with Steppenwolf. Is it possible that Lex summoned Darkseid to Earth? In the comics when Superman return from his death, he was outfitted in a black and silver version of his costume. In the Man of Steel, when Zod was explaining to Clark of his intentions for the Codex, you can see Superman wearing his all black Kryptonian attire. Superman is rumored to return in the Justice League film in his black attire. Some speculate how he may acquire this version. It’s very possible that more suits are aboard the Genesis Chamber Ship, which is still in Metropolis. At the end of Suicide Squad, Amanda Waller is giving Bruce Wayne files on metahumans. Is it possible that Bruce will also get access to the ship like Lex did? With this possibility, Bruce could learn of the ship’s technology to improve his own as Batman. He could then learn to repair it for flight to make it as a base for the Justice League. Of course this would create the tension between Bruce and Amanda because it would be theft of government property. Most importantly the ship’s computer would have the knowledge on Kryptonian biology to let Bruce know how to heal Superman. How do you think Superman will return? The main character in this film named Rey also originated on a desert type planet like Luke. Both characters are showcased as excellent pilots. Rey became more in tune with the Force way before Luke..
Han Solo is killed by his son, who happens to be the main villain of this film. Rey becomes Chewbacca’s new companion…. Captain America: Civil War is the biggest film among the character’s two films: The First Avenger and The Winter Soldier.This film brought in $678.4 million on its first weekend possibly because Civil War felt more of an Avengers film, with for the exception of Thor and The Hulk. Their absence from the film can only suggest that during this cinematic battle, they were on Asgard, a spoiler for the upcoming film Thor: Ragnarok. This Civil War film is based on the comic book stories leading up to Captain America battling with Iron Man. What makes this year in comic films exciting is iconic characters in battle with each other thus introducing new characters into the cinematic universe. Batman V Superman: Dawn of Justice is another film in which the iconic characters of DC Comics battle on screen, also heavily based upon comic stories. The cinematic version of Civil War shows how a team of heroes can be split apart by governmental influences and personal loyalties to friends. Which side did you choose? Which live battle sequence did you favor between Dawn of Justice and Civil War? Black Panther‘s feature in this film is his big introduction to the cinematic universe. 17 years ago, Wesley Snipes had set his sights on bringing the Black Panther to the big screen. Since its derailment, Wesley’s success for Marvel Comics came with the Blade film series. Actor Chadwick Boseman portrayed the African Prince of Wakanda. His costume design was superior, able to withstand high-caliber bullets without flinching. Could his costume be much stronger than Iron Man’s? The Black Panther’s fighting style and physical feats brought the warrior in a live action sequence perfectly. Battling both Captain America and Bucky took little effort for the warrior. Black Panther was able to damage Captain’s shield with his Vibranium claws and Thor couldn’t dent the shield with his own hammer. Black Panther has his own solo film, released in November of 2017. Was Civil War a perfect introduction for Black Panther or could fans have waited for his solo film? Spiderman also made a big appearance in this film. Spiderman is portrayed by Tom Holland this time around and is played as Iron Man’s understudy. Fans were able to see Spiderman in action with other heroes other than himself. His adolescent behavior and physical feats, much like in his other films, were a crowd favorite. Iron Man created a new version of Spiderman’s original costume, but with new enhancements, notably the new mechanical eyes on his mask. In the comics, Iron Man created the Iron Spider Armor for Spiderman and not his famous red and blue outfit. Since we have seen this original version of Spiderman’s costume many times in other films, would Spiderman’s entrance in this film have been even monumental if his armor was create instead? 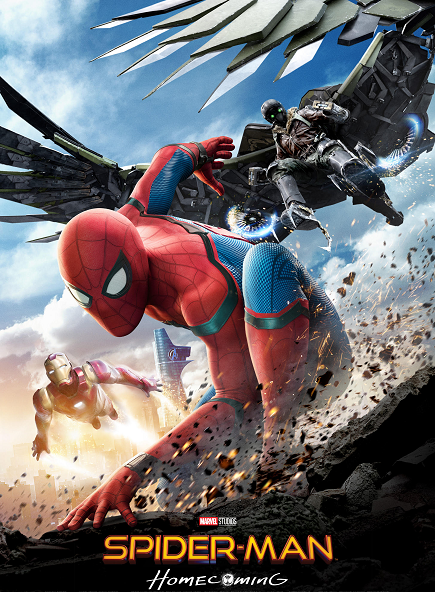 Will Tony Stark appear in Spiderman’s upcoming film? Will Tom Holland take the crown as the new Spiderman? Another crowd favorite was the return of Ant Man in the cinematic universe. His solo film became a big success for Marvel Comics and his cameo in Civil War help bridge his on screen appearance until his next solo film. 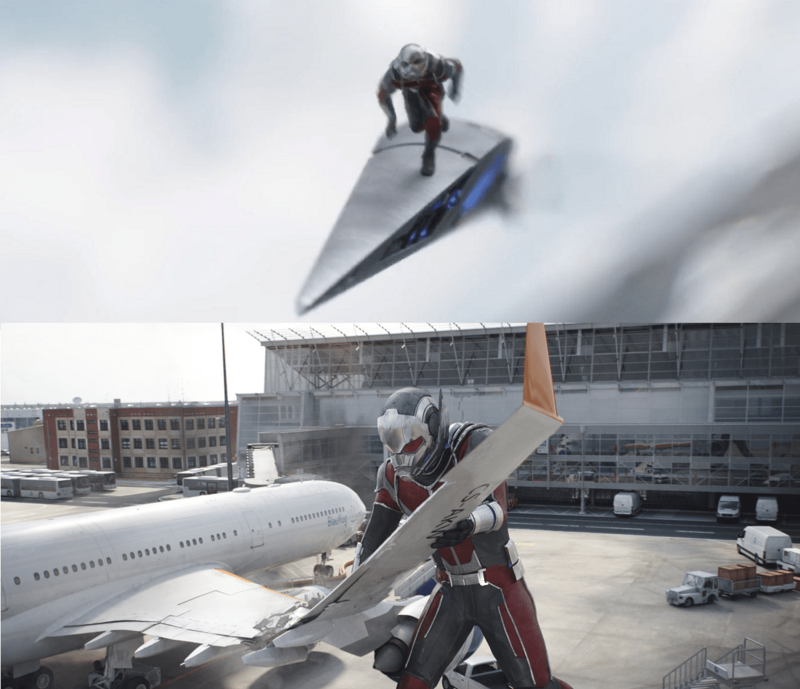 In Civil War, Scott learn to manipulate his suit even further thus creating Giant Man. It is confirmed that the Avenger films are leading up to the Infinity War Movies. Ant-Man was not apart of the comic book series Infinity Gauntlet, but will this be one of Marvel’s many changes by including him? 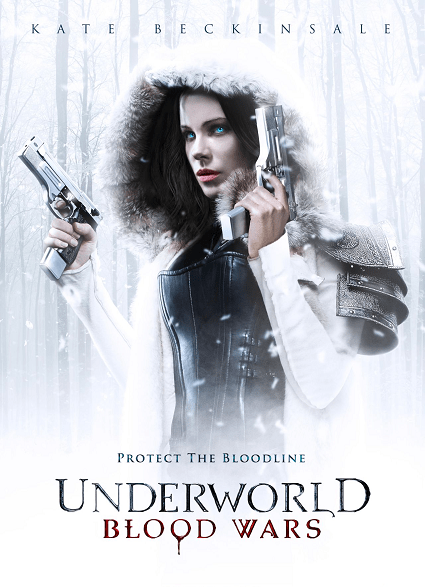 Kate Beckinsale returns as Selene in UnderWorld:Â Blood Wars.Â To date Blood Wars grossed 78.1 million worldwide, pulling in negative reviews from The New York Times and Rotten Tomatoes. UnderWorldÂ is a horror story of the greatest supernatural creatures battling through the centuries for dominance and survival. Van Helsing is another film Kate Beckinsale worked on in which vampire and werewolves share the same script. Let’s review each film leading up to Blood Wars, for this is the fifth film in the series.. The first UnderWorldÂ was released inÂ 2003, in the action/horror category as Blade was closing his film series in 2004. UnderWorld’s impact was big enough to become a solid foundation for the future films. Selene is a death dealer on the hunt for werewolves, Â in belief that they Â killed her family centuries ago. In this film, the lycans/werewolves, are searching for a human with a unique strain of DNA that will allow the two supernatural species to blend successfully. This union will create a new hybrid immortal, stronger than both the vampires and werewolves. The wanted human is Michael Corvin, who is a direct descendant of the immortal gene. Michael is eventually bitten by both species. He takes on a dark blue appearance with the vampire dominance compared to the next film where his face takes on more of the lycan species. It was revealed to Selene that it was not the werewolves who slaughtered her family but her coven vampire elder Viktor. Upon killing Viktor, Selene along with Michael are wanted among the UnderWorld. Evolution is the next movie in the series where Marcus, the first and most powerful vampire is awaken.Â This movie is a mix between the past and the present for we see the beginnings of the vampire and lycan race. Alexander Corvinus is introduced to the story as the source of the immortal virus. Through the events of the first film, Marcus is mistakely awaken with lycan blood thus transforming him into a hybrid. Unlike Michael’s hybrid form, Marcus is able to take on a batlike appearance, making him more powerful than his normal vampire state. Through the blood memory of the of the lycan and Kraven, Marcus set out to free his brother from centuries of captivity. After witnessing the change Â lycan blood did for him, Marcus believed vampire blood could turn his twin brother William into a hybrid as well, with the chance of Â him transforming back to human form once again. Evolution reveals the importance on why Selene’s family was killed for they built the prison William was held in along withÂ its location. With these key events, Selene, Michael and Marcus was eventually led to Alexander Corvinus. Marcus seemingly kills Michael, then impaled his own father for the key to his brother’s prison. Before dying, Alexander offers his blood to Selene turning her into a carrier of the original immortal virus. Selene’s strength increased pass any elder and gained the ability to survive in sunlight once again. Upon William’s freedom, the brothers were confronted by Selene and Michael. Michael was able to overpower and kill William because of his hybrid state, a form William failed to receive in time. With her new powers, Selene brought Marcus to his death along with his brother. Selene and Michael are now the last two immortals with the original virus, is it possible that Selene could become a hybrid as well? Is it possible, through his blood, Alexander could have resurrected Lucian, Amelia and Viktor when he was examining their bodies? Awakening is the next movie to follow Evolution, where the humans became aware of the lycan/vampire species, declaring termination on sight. Selene and Michael is captured among all the other immortals. The importance of their apprehension was confusing for how would anyone know of their increased powers, when all the witnesses were deceased? Awakening revealed that Selene and Michael had a child named Eve, who was the first born, perfect hybrid. Eve is linked to her parents where they can locate one another with mental eyesight. The lycans are studying Eve’s genetics to find complete immunity from all forms of silver. Along the way, a new hybrid lycan is created using the original blood of Corvinus, much like Selene’s transformation to Corvinus blood. Would William have taken on this monstrous hybrid appearance as well if he received blood from his father Alexander? Selene gains a new ally named David, who replaced Michael in the male lead role to Selene. In the ending of the film, the mental link that Selene and Eve saw is believed to be Michael finally escaping his captives. Blood Wars is next in UnderWorld timeline where the lycans have driven the vampires down to extinction. In Awakening, it was believed both species were suffering extinction but really the lycans had the winning side. Marius is the new lycan leader, with enhanced lycan abilites. In the end of Awakening, the audience believed Michael was escaping his icy prison when really he was being abducted by Marius and his men. Marius gained his new powers by draining the blood from Michael then creating a serum from it. David is revealed to be Amelia’s son, thus making him the heir of the Eastern Coven. Selene gains additional abilities from the Nordiac Coven, in the process killing Marius and avenging Michael. Eve finally is brought in the ending of the film for she was still mentally linked to Selene even though Selene was not linked to Eve. Through all the events of UnderWorld, Selene becomes a powerful elder. Will Michael ever return to the UnderWorld franchise? Producer Len Wiseman claimed there is a 6th film in development, what could be the story plot for this film? Will Selene’s powers increase even further? What will become of the Lycans now that two of their most powerful leaders have fallen? Blade was rumored to become a crossover feature for UnderWorld but was declined. Do you believe Blade could bring back the high interest in the UnderWorld franchise or would he hurt it even further? Suicide Squad was released on August 5th, with $267 million made on its opening weekend. When first released, Suicide Squad was set to have a R rating. 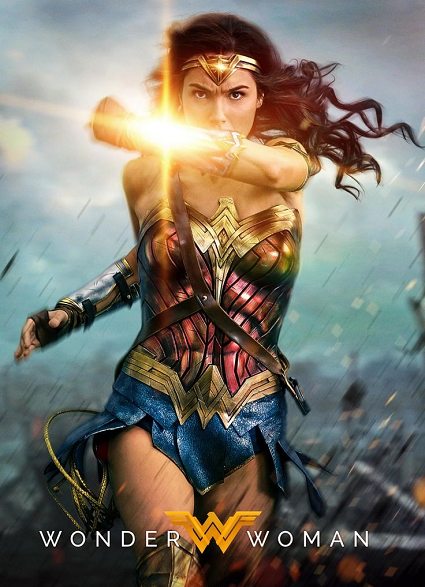 With various scene cuts, the film was level down to PG-13 like Batman V Superman: Dawn of Justice. Why again? Deadpool held no punches back with it’s R rated release and the film became a huge win for Marvel Comics. Many comic fans have mixed feelings for the film, more negative than positive. Many feel the story or threat for the Suicide Squad could have been better. What was your take on the film? The Suicide Squad is a group of dangerous criminals collected together by Amanda Waller, to take on assignments designed for no return or assignments to place blame on the criminals if spun out of control. These outlaws are individuals brought down by Batman, for the exception of Captain Boomerang, who is a criminal that commonly battles The Flash. The Flash makes an appearance in this film, but only briefly. Will Smith took the role of Deadshot, which is a change in character ethnicity like Laurence Fishburne taking the role of Perry White in Zack Synder‘s Superman. This movie is the reason Will Smith turned down Independence Day: Resurgence. Do you think Will Smith should have done the Independence Day sequel instead of this movie? Batman also had a small cameo in this film, which were flashback memories with DeadShot and Harley Quinn. Even Ben Affleck made his small cameo at the mid credit scene, showing Bruce Wayne on his mission to form his super team of heroes. Affleck’s Batman is the first character to cameo in different films other than his own feature film. Is Batman the center piece for future DC films? This film introduced the third Joker on film, which was portrayed by Jared Leto. This style of Joker is very different from the previous ones. This Joker has more of a rock star element, with the tattoos, silver teeth and jewelry. It was suggested that this Joker is actually Jason Todd, the former Robin, with few hints mentioned in Batman V Superman: Dawn of Justice. What’s unique about this film is the history and developing relationship between the Joker and Harley Quinn. Do you think this was an excellent portrayal of the two lovers? Do you think this is the last we’ll see of the Suicide Squad or will they return in Batman’s solo film? Check out some exclusive statues of the Suicide Squad provided by SideShow Collectibles!!! How did you like SpiderMan: Homecoming?Â To date, the film grossed $467.3 million with War for the Planet of the Apes being released a week after.Â Spiderman is introduced in Civil War by Tony Stark during the attempted capture of Captain America and Bucky. This film expands on the relationship between Peter and Tony, even portraying events that led up to the battle in Civil War. This is not an origin story of Spiderman, more of an origin on his future involvement with the Avengers. Â The Spider suit was one of the highlights of Homecoming! As found in the comics, Stark created suits for Spiderman to further enhance his crime fighting abilities. The traditional blue, red and black design was kept, but was upgraded with Stark’s technology. The technology allowed Spiderman to execute the different web abilities we know from the comics. Various combinations such as taser web, rapid fire, web grenades even the famous web wings were utilized during different sequences. The spidey mask was enhanced with thermal mapping, facial recognition, navigation, even a user interface called Karen. Karen functions with the suit like J.A.R.V.I.S does with the Iron Man armors. At the end of the film, Tony created another suit for Peter in hopes of him joining The Avengers. That suit didn’t receive much screen time, for Peter declined Tony’s offer of membership. What type of upgrades does that suit have that we haven’t seen yet on-screen? What was your take on Michael Keaton playing the Vulture?? This was also a highlight for the film because Batman was an iconic role for Keaton in the cinematic universe of DC Comics. Now crossing into Marvel Comics, Keaton portrays the cinematic version of Vulture, who is a salvage owner in New York City. His team was responsible for the cleanup after Loki‘s attempt to conquer the planet in the first Avengers film.Â Â After being put out of business, Toomes and his employees kept some of the alien technology to create weapons for the underground market. The Shocker character was also involved in this film as a member of Toomes’s team. The Shocker was portrayed by actor Bokeem Woodbine. Do you think the Shocker was necessary for this film? Check Out SideShow Collectibles for the latest statues for film SpiderMan Homecoming!! Does ‘Spider-Man: Homecoming’ Break the MCU Timeline? Paramount PicturesÂ released the third Star Trek film titled Beyond. Its opening weekend brought in $89.6 million, which is higher than the opening weekends of the first two films ofÂ 2009 and 2013. Many supporters feel Star Trek is very popular as Star Wars in the sci-fiction film category. Coincidentally, J.J. Abrams is the current director behind the two space franchises. Star Trek is set to have a fourth film in later years. How long will this film series continue or will Star Trek be reinvented once more in the future? With J.J. Abrams visionary talent, Star Trek has been rebooted keeping its 50 year essence in tact. New actors resembling the original crew were excellent choices among fans and most importantly the visuals. In each of the films, you notice the progression of Captain Kirk also the rising experience, personality, and family bonding of the crew. With the Enterprise, you will take noticeÂ of science theories regarding space travel at light speeds. As you can see, J.J was not shy in having the Enterprise destroyed in each film! All three moviesÂ featured its on unique villain. What so similar between the villains of each movie is that they all have a revenge mission on the Federation. Nero is a Romulan seeking to destroy Earth with a weapon that can create black holes in space. Nero revenge stemmed from the destruction of his homeworld which he believed could be saved. Khan is the second villain who sought to destroy the Federation for being used to create weapons which would start a war between two worlds. Also Khan was threaten with death along with the last of his people. The third villain is Krall, a once human and a captain. His gripe with the Federation is that Earth became unified with her universal enemies thusÂ the Federation. Krall alsoÂ felt forgotten about when his ship was disabled out on a mission. These villains see the Federation as an armada that has a vision to control the universe.Â Which of the three films did you like the most? Sadly, the original Spock Leonard Nimoy,Â and actor Anton Yelchin have passed away. Leonard passed during the pre-production of BeyondÂ and Anton pass in June, a month beforeÂ the movie’s release. Star Trek Beyond is dedicated to the memory of both actors. Interestingly, Leonard second marriage was to Susan Bay, who is cousins with the famous film director Michael Bay. What was your take on Josh Brolin playing Cable? Cable coming to the big screen is a great look for the X-Men series, but there were some powers and abilities about Cable that were not explored, which could have made this character just as good as the portrayal of Thanos. For instance, like his mother Jean Grey, Cable is an Omega Level mutant with the power of telepathy and telekinesis. His telekinetic powers seem more remotely used by his cybernetic eye, which in the comics was more used to detect psionic energy. With the heavy use of telekinesis and telepathy in this film, Cable would be mistaken for a Force User! Also, Cable is able to call force fields and make use of his time traveling device but we missed the use of his teleportation mechanism. In the comics, Deadpool makes use of the teleportation gadget where in the movie he uses the time device as his own. This is just one of many things that confused the depiction of Deadpool on-screen. It could also be the reason in the ending credits, Deadpool enters X-Men Origins: Wolverine and kills that version of Deadpool. In DP2, Cable’s mission is to destroy the mutant Firefist before he kills Cable’s family in the future. In Marvel Comics, X-Force is a team that was created by Cable in efforts to take down mutant terrorists around the world. In Deadpool 2, Wade was responsible for creating X-Force in hopes of saving Firefist from prison and Cable. Much of Deadpool’s recruits didn’t survive and what was left of X-Force eventually consisted of Cable, Deadpool, and Domino. Her feature on this film was excellent and the display of her mutant powers as a luck charm was interesting to see. Question is, if Domino can dominate luck into her favor, wouldn’t she be more deadly than Deadpool and Cable? Wouldn’t she also a difficult target to eliminate? 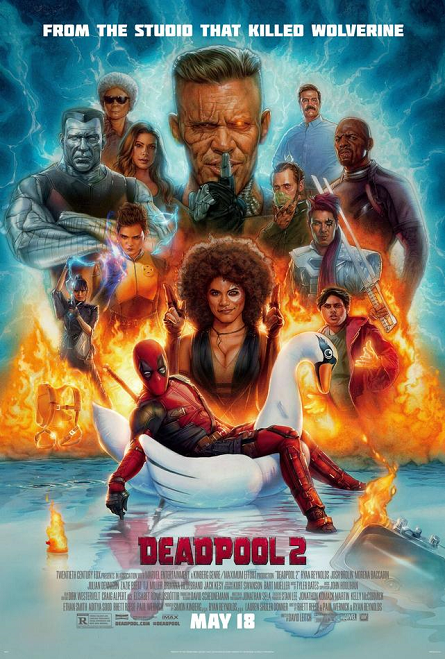 Colossus, Negasonic Teenage Warhead and Yukio return to aid Wade in his action packed adventures. A version of Yukio is featured in The Wolverine, which was a character that was heavily mentioned in both films. Yukio in The Wolverine was able to sense impending death on an individual and in DP2 she can wield electricity. Even though Hugh Jackman states that he’s done playing Wolverine, wouldn’t it be cool for him to play the role once more for either possibly the next Deadpool or an Avengers feature? There were other X-Men cameos in this film such as Beast, Cyclops, Quicksilver and Professor Xavier. All characters we’ve seen in the other X-Men movies, Negasonic Teenage Warhead would be a new addition, but why was Colossus created different from his earlier version in X2 and Days of Future Past? Why was this Colossus always in his organic steel form where in the other films, the character was in his relaxed human form, especially in the X-Mansion where no danger was present? What is your take on the film? Do you think it measures up to the first film or it was completely better? It’s not confirmed whether or not a 3rd film will be made or X-Force will be the next installment to the X-Men franchise. If Wade returns, who do you think should be in it? Take A Look At Some Hot Collectibles for Deadpool! !